“Why does everything have to have a why with you people? You know, it's a woman with deer legs, motive really isn't an issue here. " As a native southerner, I think I can correctly surmise that deer and women are near the top of many guys’ lists of favorite things, so the seventh episode of Masters of Horror brings them together in Deer Woman. I imagine that the only thing that might have gone over even better would have been Beer Woman, but I digress. Deer Woman is from John Landis, and this is the second instance in the series where the director is working from his own script, and, in this case, it really shows, as this episode is infused with Landis’s dark, sometimes morbid humor. That much is probably obvious from the title, which not only hints at the film’s central gag, but also kind of spoils it. A rash of grisly murders have broken out in the Pacific Northwest, and they all feature the same M.O., with each of the victims having been trampled to death. The only problem is that the circumstances rarely make sense and leave the local police force befuddled. Disgraced veteran cop Dwight Faraday (Brian Benben) is especially perplexed, and, though he’s been assigned to the force’s animal attacks division, he can’t help but keep investigating. The big punch line here is that this case does end up falling under the purview of animal attacks, and Landis explores this in his own playful way. 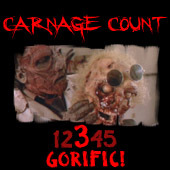 At one point--after Faraday has had a bemused discussion with a cute coroner (Sonja Bennett) over one of the ground up corpses--he begins to rife through the various possibilities that could explain these heinous crimes. We see a girl lure a guy into a semi truck and pummel him to death with a deer leg before cutting to Faraday’s reaction at his own silly fantasy that he laughs off. He then proceeds to dream up a couple of more scenarios, each more ridiculous than the last--one involves a giant, sentient deer that’s a hoot. It never occurs to him that the truth might be more absurd than anything he can dream up. The actual explanation for the events are slowly revealed to us, as we watch a gorgeous woman (Cinthia Moura) coyly smile at various men, all of whom can’t believe their luck. Not only does this attractive girl so much as look at them, she’s even very willing to take off her shirt for them. Before these guys can consider that maybe their 9th beer is causing their eyes to play tricks on them, they’re pulverized and delivered the morgue on a slab. Faraday (along with another cop played by Anthony Griffith) eventually gets closer to the truth, and it’s a rather brisk, entertaining procedural filled with solid, perfectly affable characters (plus a smarmy rival cop). Benben is a particularly empathetic center who brings a rather cliché trope (the brooding, disgraced cop) to life, and I like his rapport with both Griffith and Bennett. Both Landis and his son Max (who wrote the recent found-footage superhero flick, Chronicle) get that these characters should sort of be in on the joke, so they’re the type of people who can still laugh in the middle of this wacky case. There’s even a hint of self-awareness on the Landis’s part when they drop in references to both An American Werewolf in London and The Blues Brothers, which is either cool or annoyingly self-aggrandizing depending on how you take it (it’s the former for me, especially since the American Werewolf reference makes perfect sense in this case). Deer Woman is a well-spun tale that moves and stays intriguing, probably because it is a bit bizarre and actually feels a little fresh; Landis embraces it and charges through it with confidence, so much so that you forgive it for its narrative conveniences (such as the Native American that just happens to drop in and dump the local legend of The Deer Woman on Faraday’s lap). Jon Joffin shoots the film rather wonderfully, with the setting being appropriately gloomy and woodsy, plus Nicotero and Berger provide some chunky post-mortem corpses to up the gore quotient. The Vancouver shooting location gives this a real X-Files vibe visually, and that’s a perfect match; one can imagine that Faraday would have been the local police liaison had Mulder and Scully got wind of this strange tale of a woman with deer legs. This is another solid hit for Masters of Horror; some directors have missed, but I’ve enjoyed that this series allowed Landis, Joe Dante, and even Dario Argento deliver some of their best work in years. Deer Woman is just a perfect match all the way around, as the material is thoroughly Landis, and he’s invested enough to deliver this cool little pulpy tale with ease. About its only misstep comes with the fate of one of the characters, but I think that’s a sign that you’re actually invested enough to care. There could have been a nice story of redemption buried down in this as it pertains to Faraday’s past, but it’s not carried through especially well; still, that doesn’t completely sink Deer Woman, which you should pick up on DVD from Anchor Bay. Not only do you get another rock solid presentation, but also a hefty amount of extras that include the requisite on-set and behind-the-scenes looks, an audio commentary with Benben and Griffith, plus a neat vintage Fantasy Film Festival clip that features a young Mick Garris interviewing Landis. Deer Woman manages to recall those glory years--it's slick, smart, and funny, which makes it among the better first season episodes of Masters of Horror. Buy it!